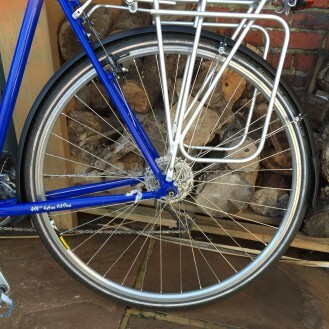 Readers of my article on SKS’s Chromoplastic mudguards will understand my need to replace the existing set. The chromoplastic’s have been brilliant and it was only a freak set of circumstances that brought about their demise. The obvious choice was to replace them with a shiny new set of black chromoplastics, but what about these other SKS models? Ok, so forget skinny race blades and half hearted clip on offerings, I’m after full length,’ fix and forget’ proper touring mudguards. 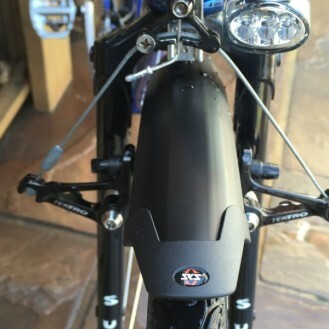 Take a look at SKS Mudguard index page here, on their menu there are 49 different mudguards to choose from and a lot of those come in different width and wheel size options. Although there are so many models there are only really three options that are suitable for a traditional touring bike; the ‘Chromoplastic’, the ‘Longboard’ and the ‘Bluemels’. 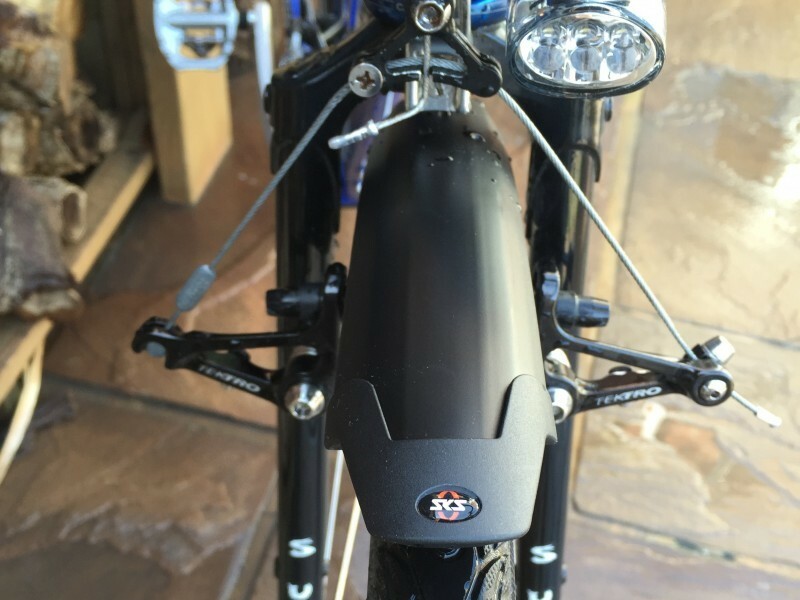 The ‘Blumels’ is SKS’s second most popular mudguard after the ‘Chromoplastic’, but how do they differ? It was a question the whole of the internet couldn’t seem to answer and to confuse things further some retailers give the ‘Bluemels’ models different names. I managed to compare what ‘Halfords’ call the Bluemels ‘Trekking’ against the Bluemels ‘Olympic Racer’. Strangely SKS themselves refer to these models as the ‘Bluemels standard ‘ and the ‘Bluemels Matt’ respectively. 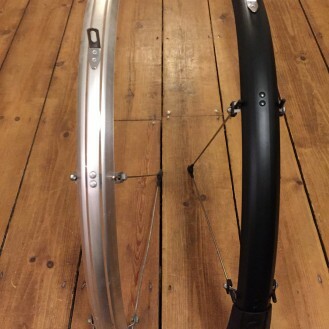 In store I compared both models in 45mm width for 700c wheels. 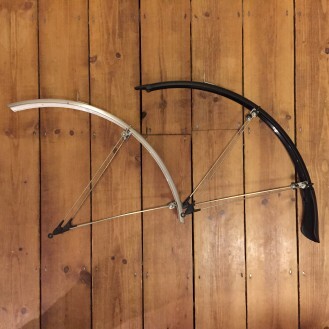 The ‘Olympic Racer’ version comes in a rugged matt black and has a built up nose piece on the front guard with splayed fin ends on the rear of both front and back guards making it longer than the ‘Bluemel Trekking’. The ‘Trekking’ version comes in a sleek high gloss black or silver and are available in 35, 42, 45, 53, 60 and 65 mm widths for 20, 24, 26 and 28 inch rims. The ‘Trekking’ model has no fin ends and an overall faster appearance than the ‘Olympic Racer’. Where ‘Halfords’ get these sub-model names from I don’t know, it’s almost as though they’ve got them the wrong way round! 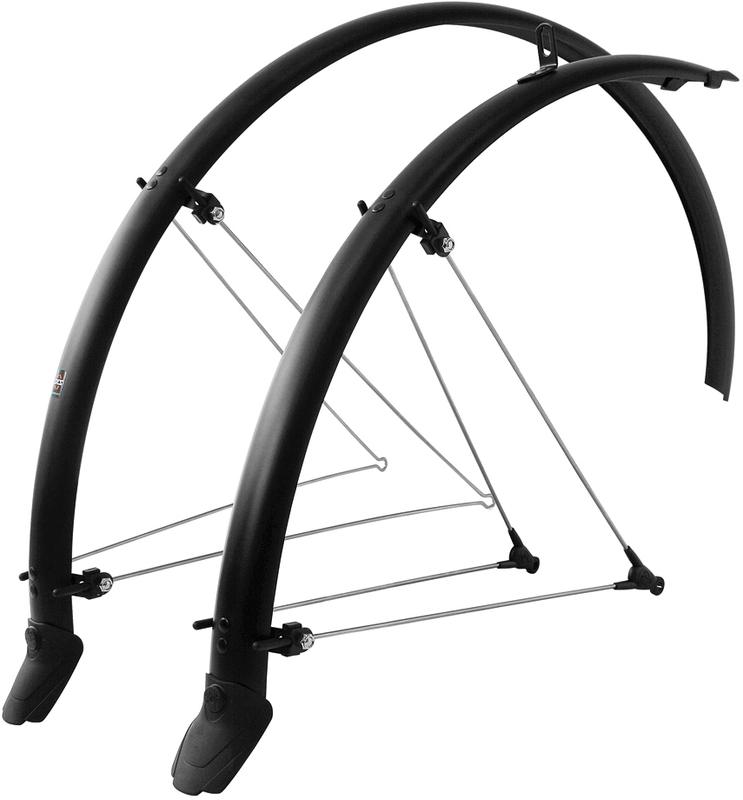 Comparing the two SKS Mudguards (below), the fixing positions and quality were identical. The only differences are the matt finish, splayed rear fins and nose detail of the ‘Bluemels matt’ model. SKS ‘Bluemels Standard’ aka ‘trekking’? SKS ‘Bluemels matt’ aka ‘olympic racer’? 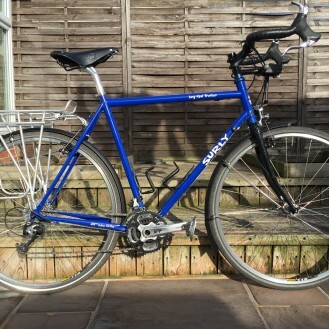 Once I had stripped my old ‘Chromoplastics’ from my bike I could compare them with the new set of ‘Bluemels matt’. 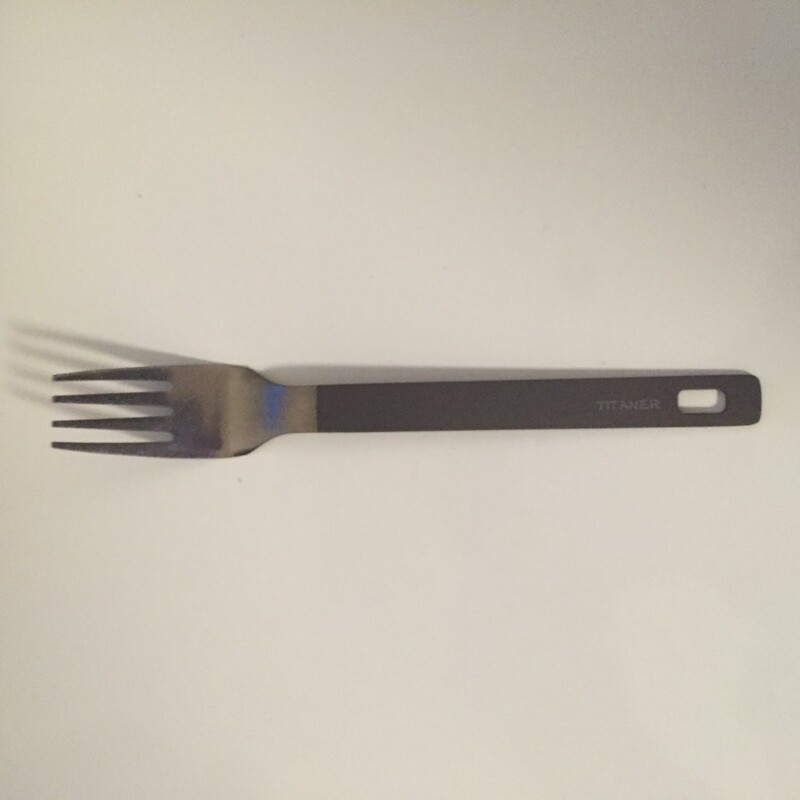 As you can see below, the profile, length, fittings and stays are almost identical , it’s only the fin end and nose detail that differs between these two models as it did when comparing the Bluemels ‘standard’ with the ‘matt’. I first thought it was the guard material that was different but the ‘Bluemels’ have the same “almost indestructible” feel as the ‘Chromoplastics’. The ‘Bluemels matt’ are available in 35, 45 and 53 mm widths, they come with good quality stainless steel fittings and 3mm stays. 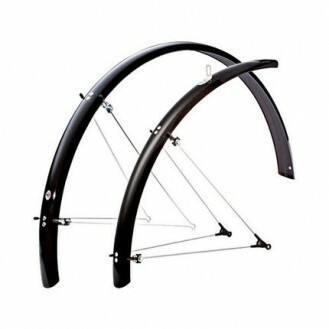 The front guard is mounted using an ASR joint which is designed to release should anything snag in your front wheel rather than throw you over the bars! This seems to be a common complaint about the Bluemels. 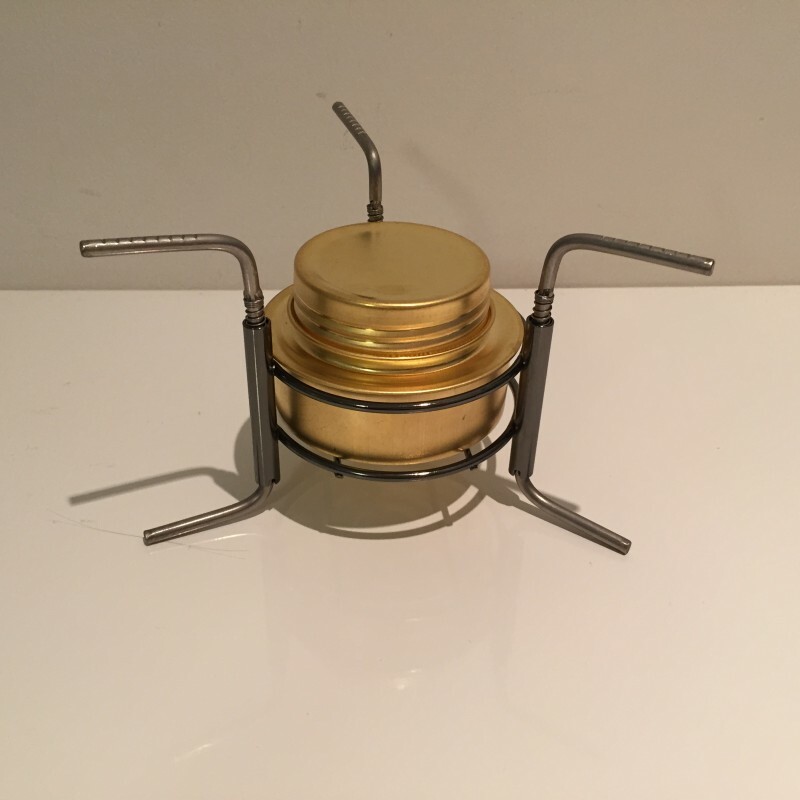 I read a lot of customer reviews and people raved about the quality but seemed to struggle with the fitting, several reviewers recommended setting aside a day! They are fiddly granted but eight hours labour is excessive, to make a nice job you’ll need a few hours. 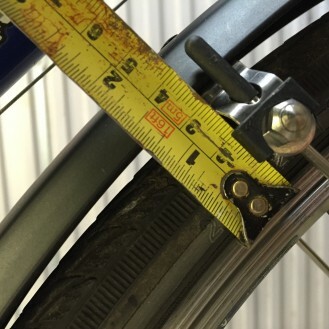 The procedure is straight forward but there are small black caps that cover the stay ends (see above) these clip on to the fixed mounting points so you have to cut the stay to exact length for equal spacing around the tire. There must be a good reason why SKS manufacture their caps like this, to me it seems a very complicated way of doing it. You are forced to keep taking off and putting back to check for equal clearance. Why the stays cant be let through the mounts, adjusted, cut and then capped I don’t understand?! 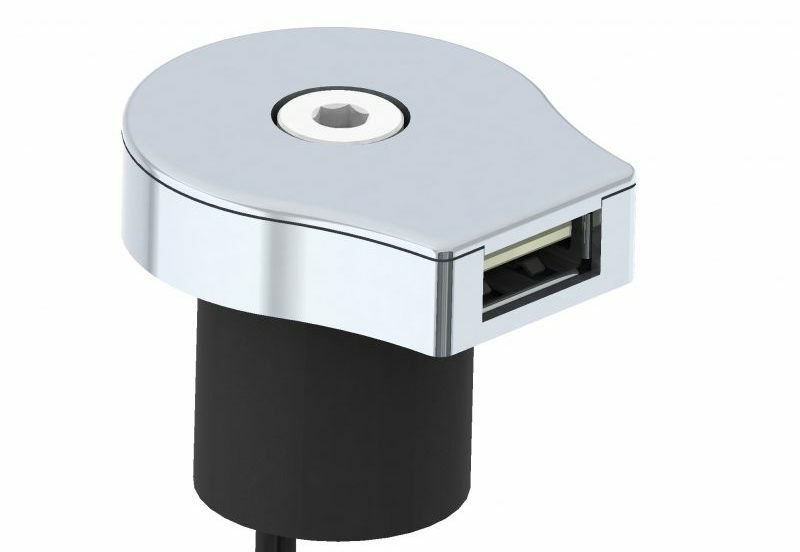 I will write a fitting guide with photo’s when I have chance and post it here. I read several reviews which mentioned the quality of the ‘Bluemels’ were not as good as the ‘Chromoplastics’ but I can’t see any difference, in fact I would imagine that the standard ‘Bluemels’ were exactly the same just without the clear strips that run the length of ‘Chromoplastics’ which look a bit dated anyway (IMHO) The ‘matt’ version of the ‘Bluemels’ are more rugged looking than my old ‘Chromoplastics’, they work superbly with next to no spray escaping, there are absolutely no rattles on road and they look good. Fitting is a little fiddly but relatively straight forward. Cost at the time of writing is RRP £32.99 but are on offer at ‘Halfords’ for £21.99 and then reduced by a further 20% off =£17.59, just remember you need to ask for ‘SKS Bluemels Olympic Racer’ for some reason!?!? Hi, yes, I can’t imagine this being a problem, can you send me a pic? You may find useful to know this. 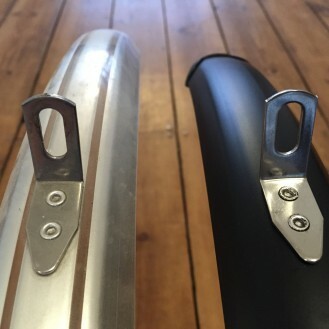 The end caps for SKS mudguard stays are meant to provide safety, in the form of avoiding cuts from exposed ends of the mudguard stays. 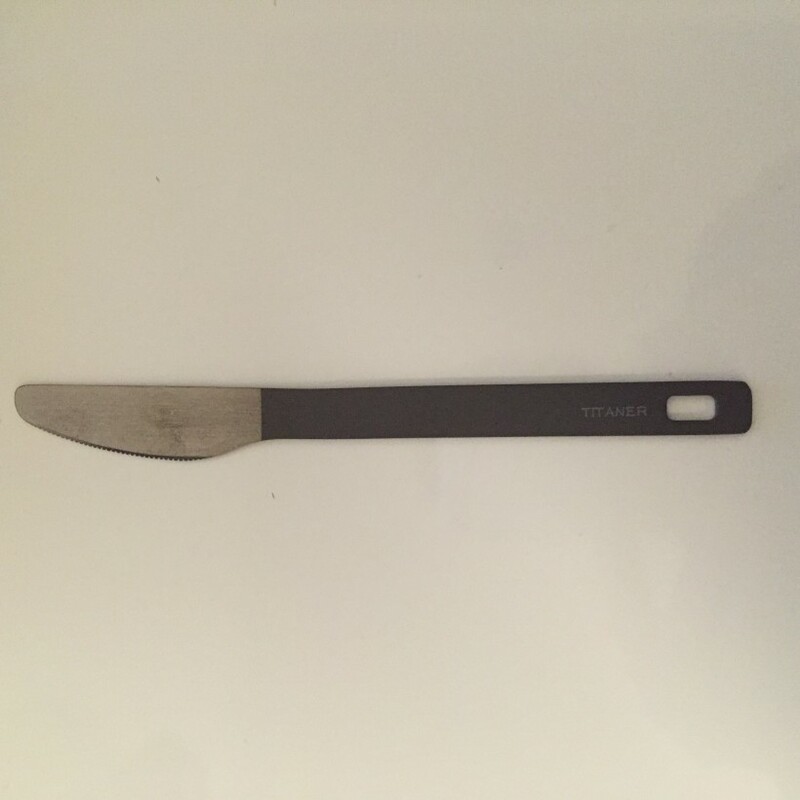 Seems overthinking, but is not, those stays are stainless steel and can be very sharp after being cut. It is a bit fiddly to fit those caps in the beginning, but once you get one it’s easy to follow the procedure. 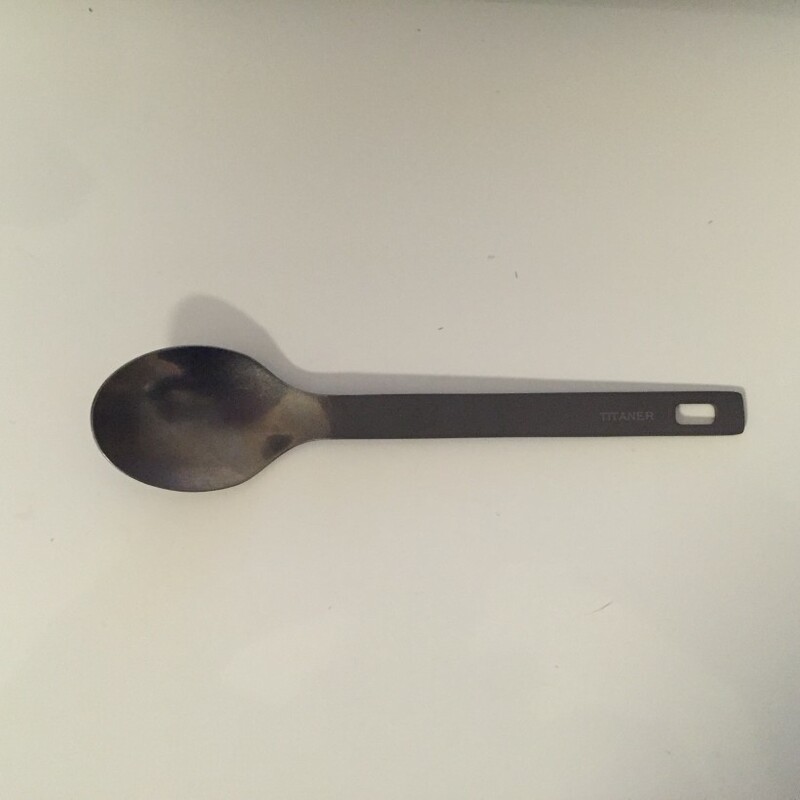 The advantage is that they can’t be lost, offering full time protection without the need of sanding/filing the end of the stays (it’s hard metal to file down to a round shape end). 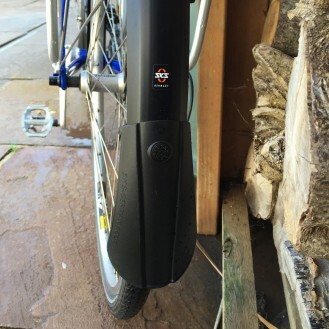 I fit them on the mudguard before fitting anything else on the bike, it makes life easier. Push JUST ENOUGH length of the cap’s tip trough the mudguard bridge, then slightly bend it the other way to get the flat slot in the bridge. 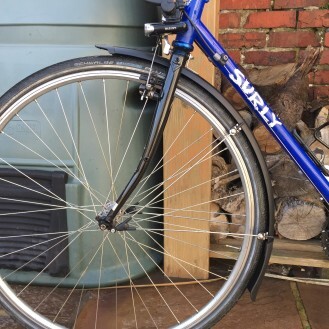 I’ve always found better to fit the mudguard(s) starting from their bridges, then working the BB fixing (for the rear), and the stays -already fixed to frame/forks- go as last. This way, one can lean the stays to the mounts, and mark how much need to be trimmed. 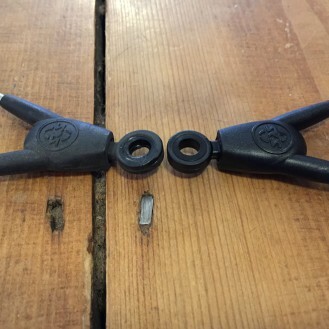 A bolt cutter, with a rag on top, is the best tool for trimming the stays. And don’t forget to put a little Loctite on the bolts, it helps a lot in avoiding loose/rattling guards. Thanks for the review, Pete! I’m searching for the Bluemels Matt. 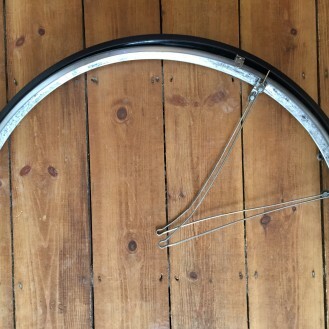 Wondering if I should get 35 or 45mm mudguard for 35mm tire. Hi Simon, I’d go for the 45mm. Take a look at my pics above, I have the 45mm guards over 28mm tyres and they don’t look out of place. Great write up, just what I was looking for. 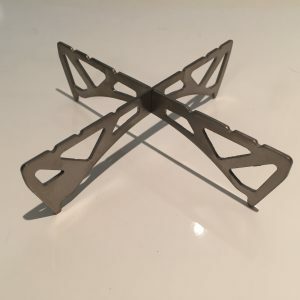 Can the fins on the matt version be removed? I’ve just had a look and yes, the fins can be removed. 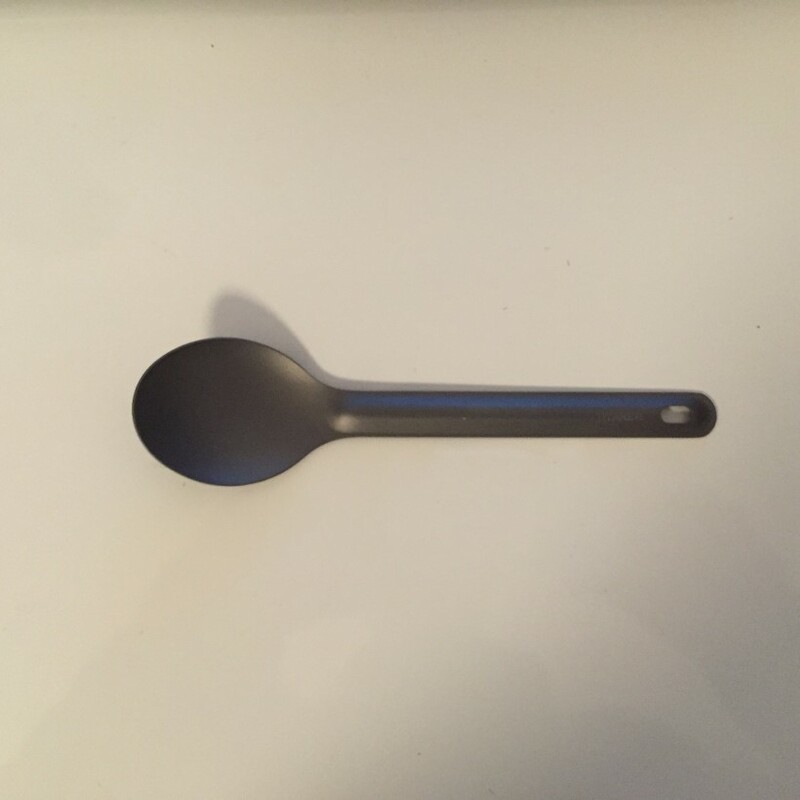 There’s a plastic fitting that needs compressing on the inside and then pushing through. 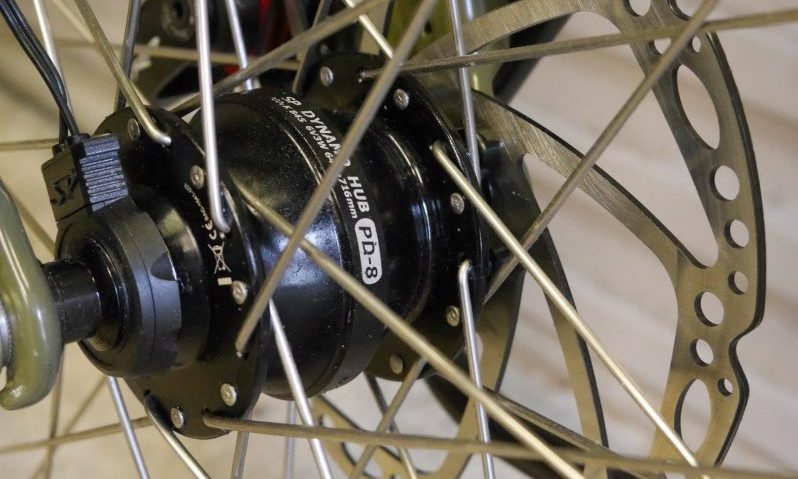 I’d imagine the fitting can then be used to block the hole in the mudguard.